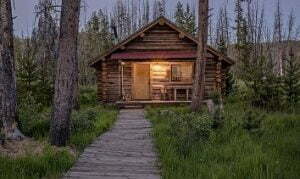 There are countless places to hike during your vacation in Central Idaho, but there is a select list of unique trails that provide visitors with a fantastic experience. The Alpine Way Trail up to Goat Lake, Idaho has everything you could want in a beautiful mountain hike. Tall, spruce and pine trees, peaceful streams, roaring waterfalls, and a picturesque alpine lake await you on your Sawtooth adventure! 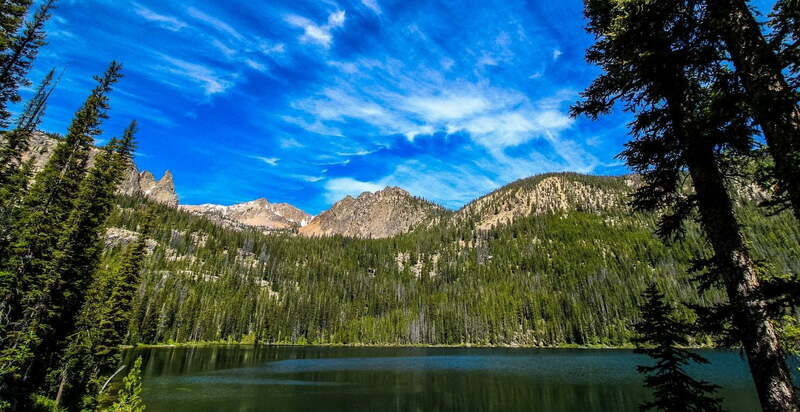 Make sure you request our free Central Idaho Vacation Guide for a full list of the best outdoor activities, attractions, and places to grab food during your mountain excursion! You’ll find the entrance to the Iron Creek Trailhead fifteen minutes southeast of Stanley. There is plenty of space in the parking lot and along the edge of the road near the trailhead. Several trails branch off from the Iron Creek Trail, but you need to take the Alpine Way Trail to access Idaho’s stunning Goat Lake. The first mile of the trip follows the babbling banks of Iron Creek before you officially enter the Sawtooth Wilderness. There’s a marked junction here where you will take a left to follow the Alpine Way Trail for another half-mile before beginning a steep ascent up toward your final destination. The trail continues up to Goat Lake, Idaho, for another mile and a half before almost disappearing to the north of Goat Falls. This is a fantastic place to stop and take the short detour down to the waterfall viewing area. Goat Falls is the largest waterfall in the Sawtooth Mountains, making this a must-see during your trip to Central Idaho. After you take plenty of pictures and a breather, conquer the last 600 feet of your hike up to the pristine shores of Goat Lake. The crystal clear water of this alpine lake combined with the towering mountains and thunderous noise of the waterfall gives Goat Lake, Idaho one of the best mountain scenes in the area! Once you get your fill of photos and take in the fantastic landscapes, head back down the same trail to complete your 8.1-mile round trip! While the first portion of the Alpine Way Trail is relatively easy, the second half of your journey can be a little rough for some. Areas of the well-worn trail can be difficult to decipher, and several steep inclines are tough to traverse. If you can get through the middle portion of the hike, it’s well worth your time and effort! Overall, the trek to Goat Lake, Idaho is moderately difficult and provides visitors with great views, physical exercise, and a fantastic experience. There are two unbelievable photo opportunities during your hike. The first is at the Goat Falls overlook, where the views of cascading water are simply stunning. Snap some shots there before heading up to Goat Lake, Idaho, where you can take photos from several different angles along the shoreline. Goat Lake is only a day hike, but it’s still important to pack some essentials to have a comfortable and safe experience! Book Your Central Idaho Getaway! Return to your comfortable accommodations at Redfish Lake Lodge after your fun and exhausting hike to Goat Lake! Revel in our beautiful waterfront attractions and activities around our grounds like live music, boat rentals, fishing, swimming, and much more! We have several delicious dining options in addition to special packages that enhance your experience in our mountain paradise! Start planning your adventure and book your accommodation today! Couldn’t find any availability? Check out our three Sister Properties down the road in Stanley for a unique and unparalleled stay!